When you shoot video with a Smartphone it can be hard to keep it stable. This is because Smartphones are light and can be difficult to keep still for long periods of time. The result of this is wobbly images and poor looking video. To solve this problem you should think about investing in a good Smartphone handle or Smartphone stabiliser case with handles. These are great in helping to reduce the dreaded wobble in your video and are cheap to buy. They range from simple pistol grips to Smartphone stabilisers with equipment mounts. With a stabiliser rig you can add lenses, lights and microphones with the help of lens mounts and cold shoe mounts for accessories. Most Smartphone grips and stabiliser cases will also usually have ¼ inch thread screw mount so you can put them on a tripod as well. 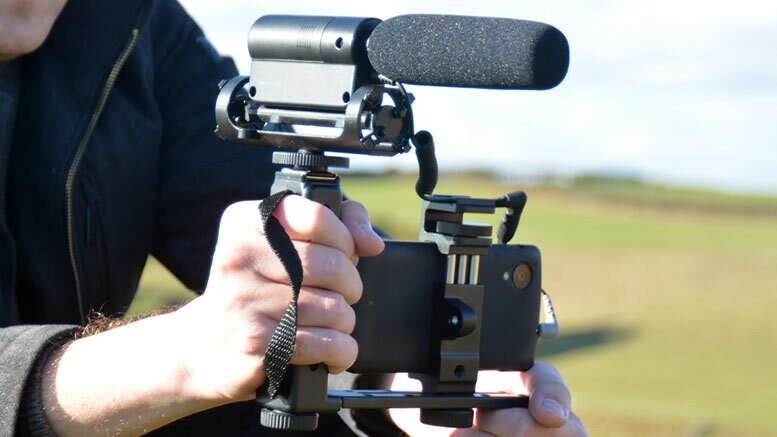 The BeastGrip Pro is an adjustable lens and Smartphone stabiliser that will fit around most modern Smartphones. 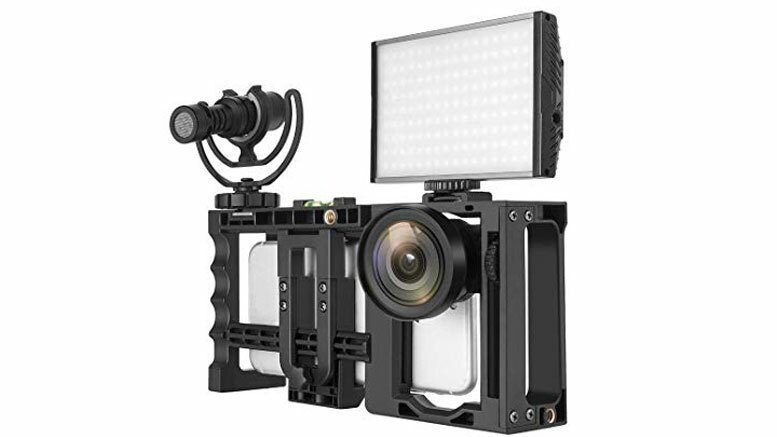 It has a modular design, which means it can adjust to the needs of the user and can adapt for adding lights, microphones and 37mm lenses. The stabiliser itself has spring-loaded clamps, which should ensure a secure grip around a Smartphone and keep it firmly in place. You simply place you Smartphone into the BeastGrip Pro and then push the two sides together until it securely grips around your Smartphone. These clamps also double up as handles, and give you a secure grip on the stabiliser for when you are running around doing hand-held shots. The BeastGrip Pro also has several cold shoe mounts for you to add equipment. 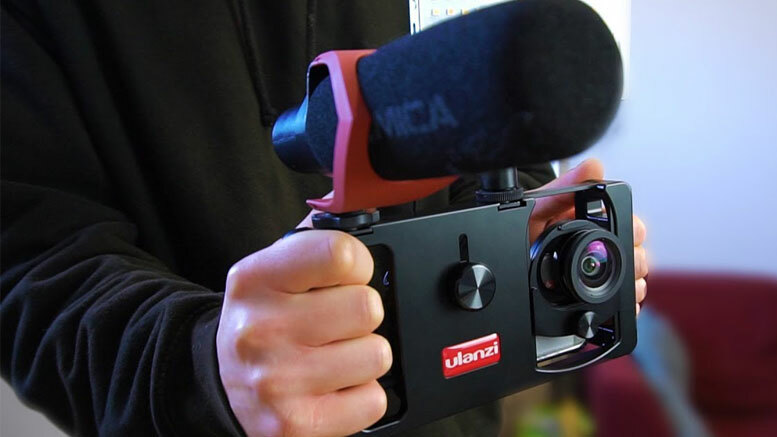 This is useful for adding microphones, lights and other filmmaking gear. There are also several ¼ screw mounts on the BeastGrip Pro and you can use these to add extra cold shoe mounts or screw in other items of equipment. There is also one on the bottom of the BeastGrip Pro so you can attach it to a tripod if needed. The BeastGrip Pro also comes with an adjustable lens mount. You simply move the lens slider into the position where you want it to cover your Smartphone lens. The lens mount will fit any lens with a 37mm thread, so you can add many different lenses like a 2x telephoto or a wide-angle. The obvious advantage to the BeastGrip Pro is that it is not specific to one make or model of Smartphone. So if you do update your Smartphone you will be able to continue to use the BeastGrip Pro with it. Be aware though to check the size of your Smartphone before buying as it may not fit all models. 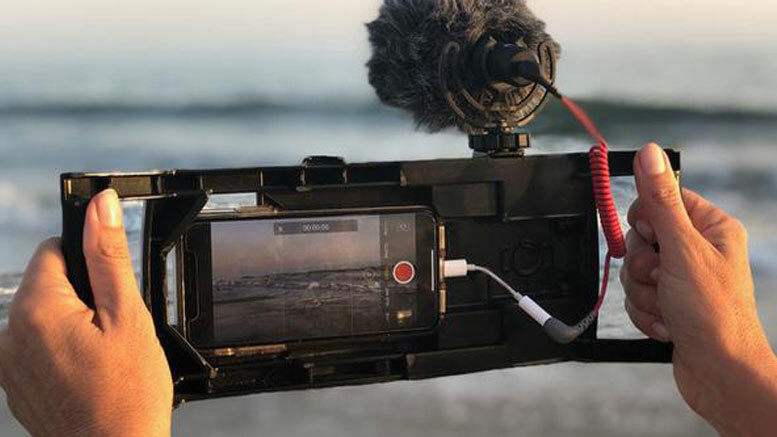 If the BeastGrip Pro is out of your price range you might want to consider the Zecti Smartphone Rig. 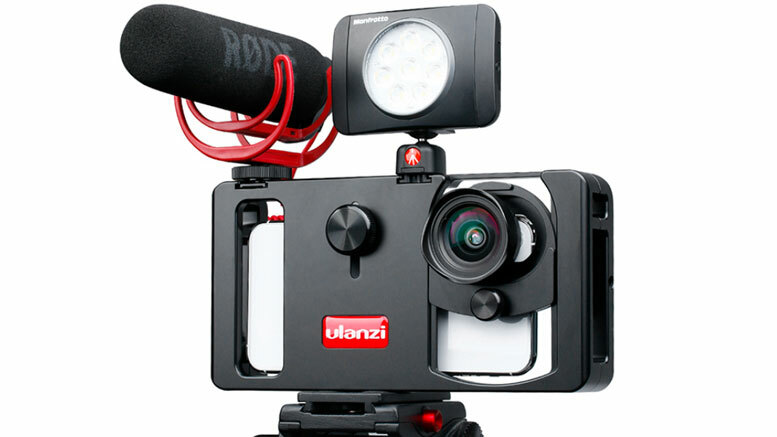 It has a similar design to the BeastGrip Pro but is much cheaper to buy. It comes with a bubble spirit level to help you to get correct level shots. So if you are struggling to get level on awkward ground this will be a great help. The stabiliser comes with two cold shoe mounts so you can add any extra equipment you may need like a light or a microphone. There is also seven ¼ inch screw mounts so you can attach it to a tripod at any angle or attach other filmmaking equipment. You can also add 37mm lenses to the fully adjustable lens mount. You can move this to any position and should adjust for most Smartphones. 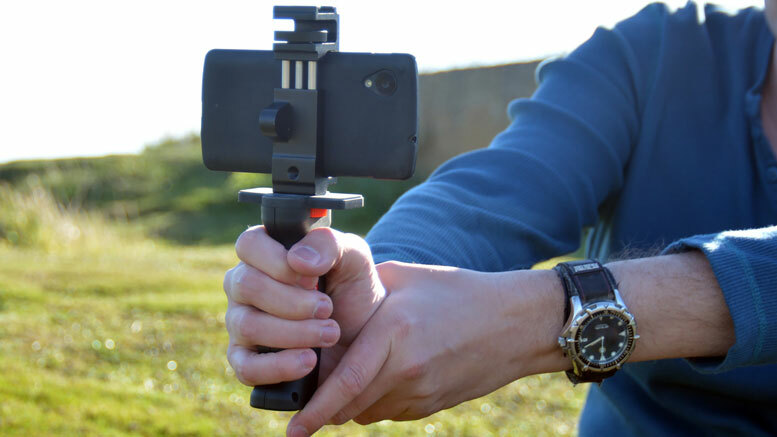 The stabiliser itself is fully adjustable and will fit most iPhones and other Smartphones with or without a case on. So whatever make or model Smartphone you own the Zecti should fit it. Ulanzi U-Rig Metal Handheld Stabiliser is fully compatible with Apple iPhones and most Android models including dual camera phones. It has a Universal Lens Adapter with 37mm & 17mm lens mounts which are fully adjustable to fit your Smartphone. Most standard 37mm and 17mm threaded lenses will fit just fine and it is compatible with a variety of conversion lenses, filters and DOF adapters. It has two Cold Shoe Mounts and four 1/4 inch threaded Mounts. 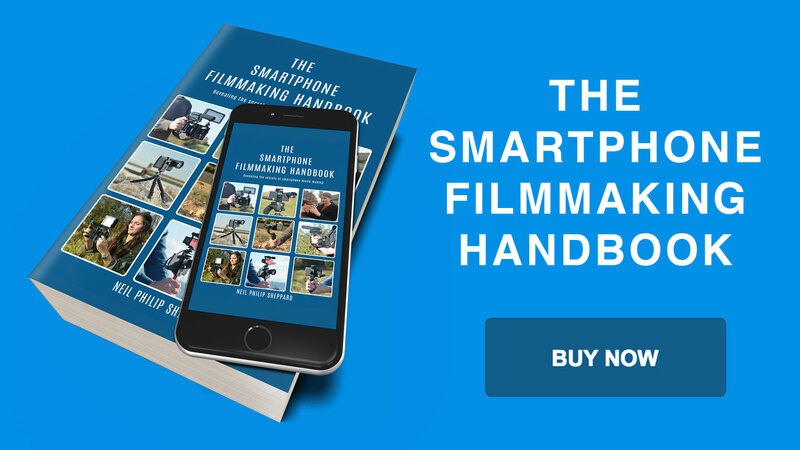 This will allow you to attach a variety of photography and filmmaking gear to improve your videos. Its metal design also makes it near indestructible. So it will put up with all the action you can throw at it. You can also use if with or without a tripod and it will mount on any tripods with a 1/4 inch screw. The iOgrapher is a hand-held Smartphone stabiliser case that gives you the ability to attach lights, microphones and other equipment to an iPhone or Android Smartphone. It has an easy clip system so it’s not too difficult to move your Smartphone in and out of the stabiliser when you are ready to begin filming. This is a great help when it comes to setting up in a hurry. On each side of the case are two large handles, which will give you a good grip on your Smartphone. Perfect for going hand-held or when you need to be mobile. There are two cold shoe mounts on top of the case, which means you can add any microphones or lights as needed. 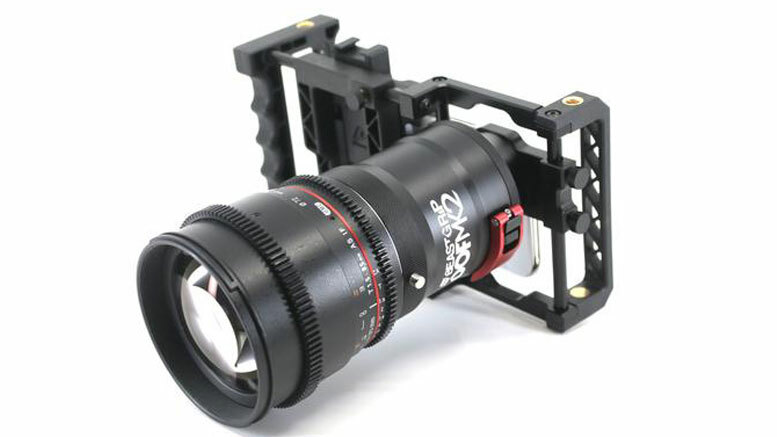 These are useful for adding extra equipment and are similar to those found on the BeastGrip Pro. At the bottom of the case is a ¼ inch screw mount, which means you can easily attach the iOgrapher to a tripod when you tire of going hand-held. There are also extra ¼ inch mounts on the sides so you can put the iOgrapher into a portrait position on a tripod or screw in other equipment as needed. 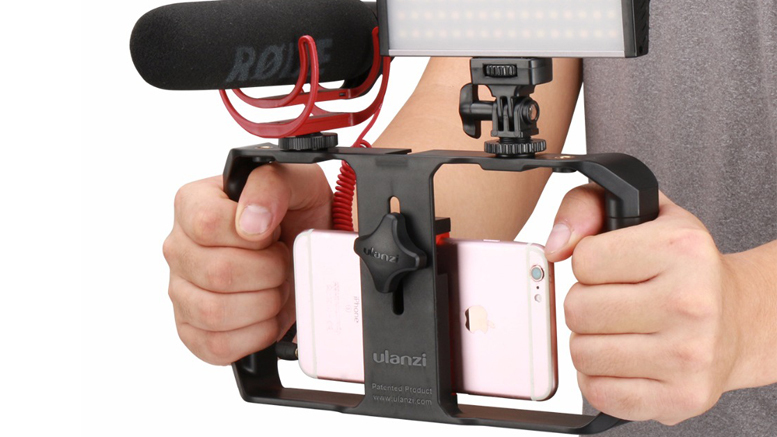 If you are looking for low cost Smartphone stabiliser grip the Ulanzi U Rig Pro is great budget answer. This is the newer version of the Ulanzi’s Smartphone grip and it has many improvements over the older version. It has two cold shoe mounts for you to add a light or a microphone. 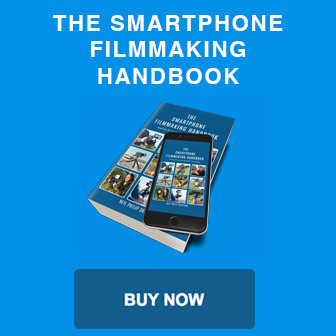 So it’s handy for adding extra equipment to your Smartphone. It comes with two large handles for you to use if you want to go hand-held. It also has a 1/4-inch screw mount on the bottom so if you tire of carrying it about you can also mount it on a tripod. The universal Smartphone grip will fit most Smartphones such as the iPhone 8 or XS but you might want to check it fits some of the larger Smartphones before you buy it. If you are on a budget, this can be an excellent solution to remove the shake from your Smartphone video. You normally use a flashgun grip to add an external flash to a DSLR camera but it can also double up as a handy Smartphone holder. A DSLR flashgun grip has a 1/4-inch screw that you use to mount a DSLR camera but you can also use this to add a Smartphone tripod adaptor like the Shoulderpod S2 or the Square Jelly Fish. Combine these two together and you have a great handgrip for your Smartphone. The bonus of the Flashgun Grip is that they have a cold shoe mount for the Flash. You can use this mount to attach lights, microphones or other such equipment. This is incredibly useful and a good solution for adding extra equipment to your Smartphone. This is also handy if your Smartphone tripod adaptor does not have a cold shoe mount. Or if it does, you will get an extra one to attach equipment too. There are many different Flashgun Grips on the market and the build quality can vary so make sure you pick one that will put up with some wear and tear. If you can, get a metal one, as this is a better choice than some of the cheaper plastic ones available. Also, you may consider getting one that you can fold down or collapse. This means the Flashgun Grip can easily pack down into your kitbag when you need to transport it. Pistol grips for cameras have been around for years. I have one I use that originally came with a 16mm film camera from the 1960’s. They are simple in design but are excellent for helping stabilise your video. They are also small and won’t take up much room in your kitbag if you need to grab a quick solution to keep you Smartphone stable. The DSLR pistol grip is similar in shape to the grip on a handgun and they usually have a 1/4 inch screw at the top. This can easily screw into a Smartphone tripod adaptor like the Shoulderpod S2 or the Square Jelly Fish. Add the two together and you have a great portable solution for removing the shake from your video. There are many different pistol grips available. They all do the same job and you can usually find one for around $10, so they are cheap to buy. The build quality can vary so be careful to check the quality of the grip before making your purchase. If you are on a budget, and are looking for a cheap solution to keep your Smartphone stable, this is a good choice.